4.6 (Based on 11 Reviews) 91% of reviewers recommended this product. 5.0 Great eyepiece for the money! I just got into astronomy and was looking to upgrade my eyepieces. I was willing to pay about triple the money that these cost for an eyepiece. These were recommended to me on a message board, so I decided to give them a try, and I’m so glad that I did! I bought the 8mm and 5mm and love them both! I was able to buy both for what I would of paid for one of the other brands. I have gotten amazing views out of these with just a beginner telescope! I definitely recommend these!! I have 3 of these eyepieces and believe these are the best value in excellent quality / moderate FOV with a very flat field, available on the market today.The FOV is perfect, not stretched to much, very flat with pinpoint stars to the edge.The true color rendition is very good, very little or no internal reflections. I have very expensive Naglers in my special eyepiece case but i find i am using these just as often and am very pleased.The twist up eyepiece cup is a very nice feature too. Plus, you get free shipping, and most items are here in two days. I live in Georgia. Not bad for free shipping. Agena is rapidly becoming my favorite vendor! great these eyepieces are considering their cost. They just really got my attention, I noticed & said WOW! What a surprise! They are BRIGHT! Very Clear! Defiantly an overlooked eyepiece series. I have the 5mm up to 18mm. They work very well on my 80mm ED Telescope & on the rest on my scopes too. 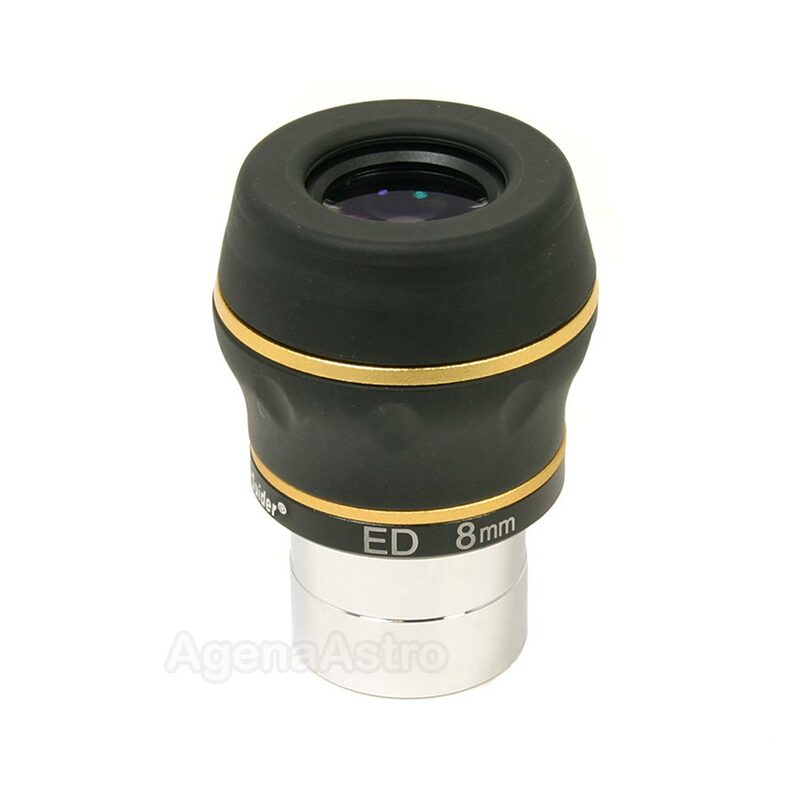 Less lenses in the eyepiece lets more light come through, and with the ED lenses they are very clear. I have many very expensive eyepieces but these cheaper ones are nothing to scoff at. I have found lots of different eyepieces in my kit keeps it interesting. Lots of different views makes it fun. threads on the twist up eye cup could of been a little better, that's where they cut the costs & spent it on the lenses. Don't get me wrong they work great. I just try to give honest opinions & view points. I'm getting very nice, clear and wide viwes with this lens. Another excellent quality eyepiece added to my collection. My main eyepiece is the Agena 12mm and the 8 gives me the same high quality views when conditions are good and the target just needs a bit more magnification. Looking forward to the next purchase. As in all the rest of the Agena Starguider series of eyepieces, just superb! Really nice contrast, sharp to the edge and a perfect 62 degree FOV. At this price point, this eyepiece delivers an excellent image in both of my scopes, a refractor and a reflector. I use it for better detail on Jupiter and Saturn and split doubles with it. When the seeing is good, images are sharp and clear. I own several others in this line and I am happy with all of them. Review by Stars N Bikes of Long Island, NY. I picked up this as a grab and go for my smaller 80mm and 127mm scopes but thought I'd give it a try in my 14" f/4.7. I compared it with a Vixen 8mm LVW at 209X. Objects included the Moon, Jupiter, Mars and Saturn along with several open clusters. I was hard pressed to find any significant difference. There were some internal reflections visible on Jupiter, but other than the slightly narrower field in the Starguider, there was nothing significant. Review by Dean of Manila Philippines. Provides nice view of saturn with my Nexstar 90GT at about 110x. Details were visible including the Cassini Division. Moon details are better than the stock 10mm EP. I was also able to view the sun with proper filter of course. Eye needs to be on proper position to prevent blackouts but easy enough to do. Review by Keith of Bishop, CA. Good flat FOV. I like the screw style eyecup for putting your eye in perfect spot. Have treated lens very well but have a couple dust specs between seals. Review by Stefano B of Arezzo, Italy.